Looking forward to mounting these race wheels for Sunday! The Swim: I’ve mentioned this many times before, but the swim simply does not give me a lot of bang for my buck. Although my swim times have steadily improved and I recently swam a sub-25 pool mile, the swim won’t be the reason why I break 5:30. Instead, I’m going to play to my strength and swim easy – effectively treating it as an extended warmup for a massive effort on the bike. Goal: sub-36 minute swim. 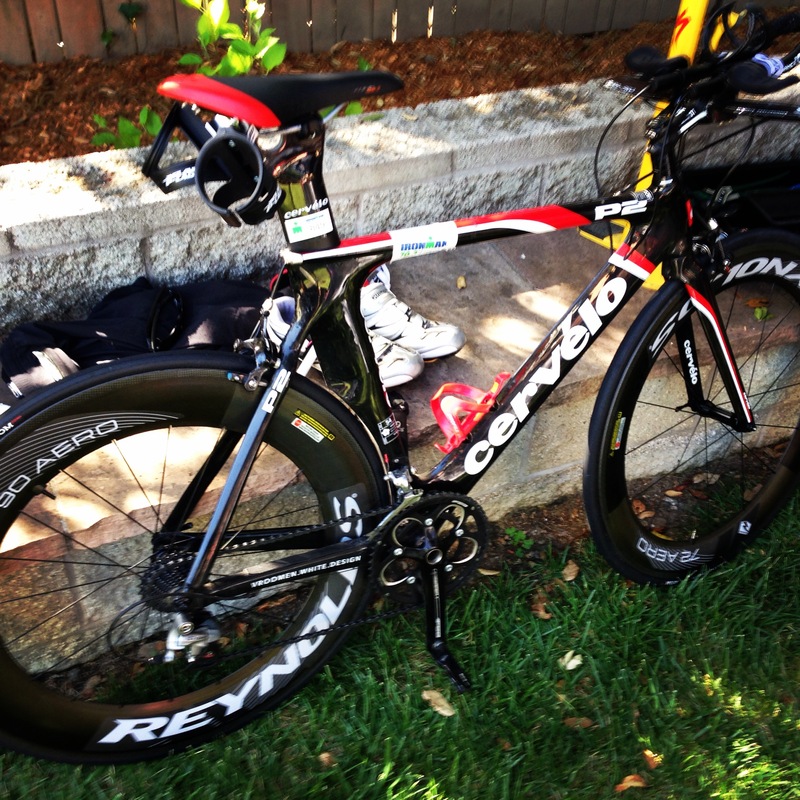 The Bike: Plain and simple – I’m taking no prisoners on Sunday. After throwing down a 22mph average at Vineman Monte Rio and a 2:45 at the course preview ride (without race wheels), I’m going to hit it hard on Sunday and improve on the course ride. I’m aiming high – Goal: sub 2:45 bike. Ready to put Wildflower Long Course behind me and shave an hour off my finish time. The Run: This will be the biggest question mark come Sunday. 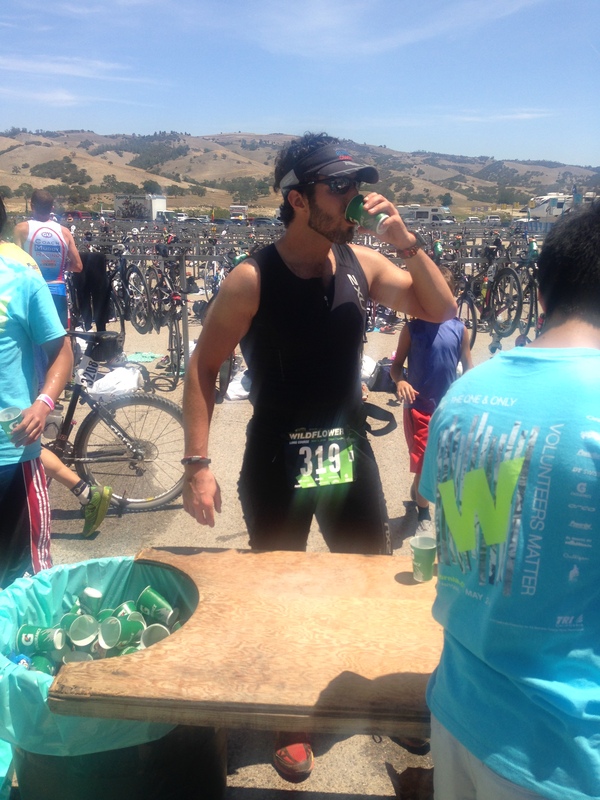 Vineman is traditionally a very warm race where temperatures occasionally exceed 100 degrees. Although the forecast on Sunday is calling for a high of 87, I’m used to much cooler temperatures in SF. My fastest 70.3 run split stands at 1:59 – I’ve since lost 15 pounds and run a 1:37 open half marathon, and I’m confident that I can make a big dent in that time – heat aside. Goal: sub 1:50 run. Putting it all together, if I hit all of my goals spend under 6 minutes in transition, I will finish sub 5:20. My current PR stands at 5:44 on what was definitely a more difficult course than Vineman when I wasn’t training for Ironman. Knowing that long courses rarely go off without a hitch, I gave myself a buffer that should still leave enough room to break 5:30 in style. Game on! Awesome!!! You can do it!! Keep positive and hydrate hydrate hydrate(starting now!) Have fun and good luck!!! Thanks Leslie! I’m loading up now – looking forward to crushing it this weekend! You must be stoked – IMC is almost here! GOOD LUCK, JESSE! You’re going to beat that 5:30 time for sure! Thank you! Then it’s just a matter of doubling it, removing oxygen from the air and adding in a few mountain passes – no big deal! g’luck. i hope you make your goal! i’ll see you out there on sunday too. my goal is to have a good time, and if i beat 6:58 then i’ll be happier than last year! i’ll be hanging with my Pasadena Triathlon Club friends. Give us a shout out “Blogger dude!” if you see us. thanks, joe. Good luck to you too Joe – I’ll keep an eye out for you and the PTC squad! I am a firm believer in making “bold statements”! Endurance sports are so mental, and believing you can achieve your goal, and visualizing it is so key! Not to mention your amazing dedication and training in 2014….so cool you have been able to improve in 3 sports this year! You are totally going to rock your race and break 5:30!! I couldn’t agree more – the first step is visualizing your success. I appreciate the kind words and am looking forward to a big PR this weekend! Thanks for reading! You’re going to have a great race!!! Can’t wait to hear!! How exciting!! You’ll do it! No problem. You’re more than ready. Good luck out there this weekend! Hope the weather holds up for a cooler race! Good luck. You have a fantastic mindset and a great plan of attack. I am sure you will be great!